Detect, diagnose and repair pump problems before they happen. While the Industrial Internet of Things (IIoT), augmented reality and digital twin technologies have engineers dreaming of future possibilities, it is important that plants not disregard the fundamental issues—i.e., enhancing productivity and reducing unscheduled downtime—that have been around for decades. New, imaginative technologies could provide operators better visibility into asset health and improve production uptime. And, while the possibilities of these technologies are certainly worth waiting for, advancements in industrial wireless technologies can deliver many of these benefits today. While some industrial wireless technologies have existed for more than a decade, chemical plants have been slow to adopt them because of concerns regarding connectivity, reliability and security. In fact, at most chemical plants, fewer than 20 percent of pumps have any instrumentation at all. Most of the instrumentation that does exist is not wireless and is only used to monitor critical assets such as turbines, compressors and other large rotating equipment. How do these plants monitor their remaining assets? They rely on third-party service providers to inspect their equipment manually. Technicians or contractors walk the plant with handheld devices to collect vibration data on each piece of rotating equipment. Given that an average chemical plant has an installed base of 5,000 pumps, third-party providers manually collect data on 4,500 pumps monthly. Assuming a technician can check 60 pumps in a day, it would take about three full-time employees 30 days each to collect data on all 4,500 pumps. Most chemical plants inspect pumps once or twice a month. While monthly site walk-arounds provide basic pump vibration data, they do little to help chemical plants improve productivity, reduce costs or boost efficiency. In fact, they can encourage inefficiencies because technicians spend an inordinate amount of time collecting data on equipment that might be perfectly healthy. Equipment walk-arounds also provide a snapshot of a pump’s health at a specific time frame. A technician may obtain a vibration spectrum that indicates a pump is working correctly, only to have the pump experience a problem a few days later. But, because the technician does not inspect that pump again for another month, the problem could go undetected and lead to a failure between inspections. So, even when a plant is actively inspecting pumps, the equipment’s reliability could still be compromised. Manually recording pump performance also creates a data backlog because of the vast amount of data collected. Not all data that a plant collects is reviewed. When an anomaly is detected, the data is sent to vibration experts for further analysis. With a limited number of vibration analysts at a plant, it could take days to review the data and recommend corrective actions. At most plants, up to 90 percent of information gathered from manual inspections is not analyzed or is only reviewed after a pump fails. Factor in human error, data inaccuracies and inconsistent results, and it is easy to see why chemical plants are not gaining much from this antiquated process. Wireless asset performance monitoring offers a more effective and efficient way for chemical plants to evaluate pump performance and identify operational improvements. 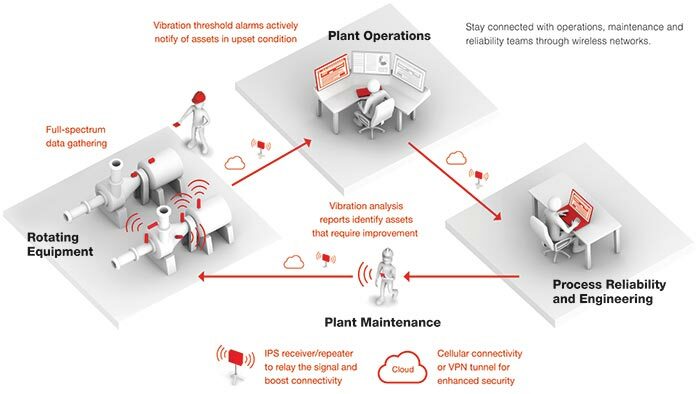 Using wireless monitoring technology, plants can optimize performance and increase mean time between repair (MTBR), reducing maintenance costs and total cost of ownership. In a typical wireless monitoring setup, battery-driven sensors installed on individual pumps transmit critical parametric data to a central gateway every few minutes, thereby eliminating the need for manual data collection across thousands of assets. This data can be stored on the plant’s network so the control center continuously monitors assets and notifies technicians of problems. Reliability engineers can proactively access data 24/7, which enables them to set parameter thresholds with automatic alerts as soon as an anomaly is detected rather than waiting on a call from the control center. Both control center notification and proactive access to data are effective methods of addressing an anomaly. Daily reports can be provided to vibration analysts for a detailed analysis and suggested corrective actions. By focusing efforts on the equipment that needs attention, plants can improve asset reliability while also improving the productivity of their reliability and maintenance engineers. Given the benefits of using wireless monitoring, one might question why chemical plants are only using the technology on 10 percent of their pumps. One of the reasons is the low cost of labor. It does not cost much for chemical plants to outsource manual pump data collection to a third party or even use their own resources. In an environment of cost cutting, this might seem like an attractive option. However, such data collection is a futile exercise if it fails to lead to actionable insights.